Silverblade 250 EFI - Keeway Q.J. 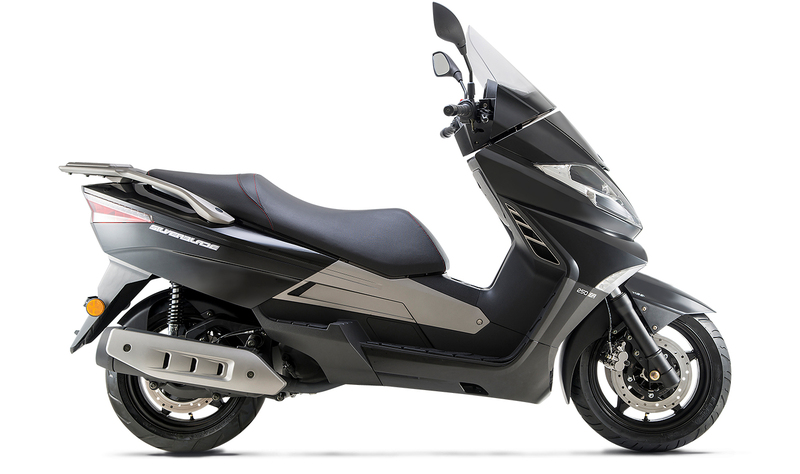 The Silverblade’s 249cc single-cylinder four-stroke air-cooled engine makes 21 horsepower and delivers it quietly and smoothly through a no-shift CV transmission. Just turn the throttle and go! All-day comfort comes from a ultra-plush, two-place saddle, an amazingly roomy riding position and super supple suspension, which provides a smooth ride on a variety of roads. There’s also under-seat storage and a handy luggage rack/passenger grab rail. The Silverblade 250’s 14-inch wheels are cast-alloy units that hold grippy tires and powerful disc brakes front and rear, including a dual disc setup up front for quick and secure stops. A compliant telescopic fork up front and a single-shock system in back provide an ultra plush ride – the perfect thing for running back and forth to work, or on a weekend trek in the country. TIPO 1-cilindro/4-tiempos/2-válvulas, Refrigerado por agua, SOHC. *Keeway QJ se reserva el derecho de modificar las especificaciones técnicas, el equipo, la configuración y los colores sin previo aviso.